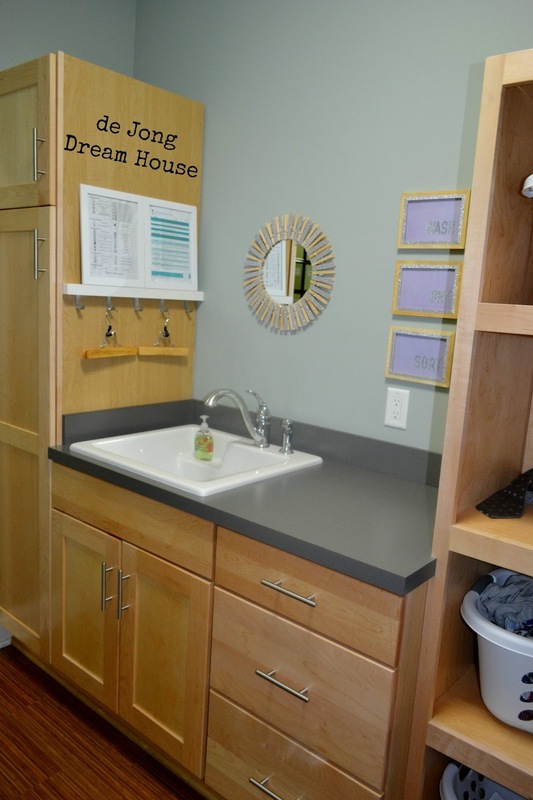 As part of our universal design plans, we put it in a full laundry room upstairs, and have a small laundry closet on the first floor off the mudroom. Last night I enlisted Niels help to put up a few more items in our upstairs laundry room. It's not completely finished. I have an idea for the long as-of-yet-blank wall, but it's far enough along that I'm ready to give a tour. Welcome to our upstairs laundry. We splurged a bit with the ironing drawer so we wouldn't always have an ironing board set out. I don't iron, because I don't buy clothes that require ironing. But Niels will occasionally iron his shirts. With the drawer, it's easy to keep the laundry room clear from obstructions, that is, less that I can trip over! We chose this sink because we like that the soap was hidden from view, and also because we liked the the washboard as I'm sure we'll put it to good use as our boy grows up. I liked the idea of cubbies for sorting our laundry. We built our house with the long-term view, so at some point, our son will start doing his own laundry. He's only three now, so he gets a pass for now. But this way, there's a cubby for each of us, plus an extra for linens, or for the next year, our exchange student. I made the mirror out of clothes pins and glitter washi tape, and the framed art comes from repurposed frames, extra scrapbook paper, glitter sticker letters and more of the washi tape. The hook ledge on the right side comes from Ikea. The hangers are waiting for me to start my next project. We didn't put any cabinets above the sink because, frankly, we have more storage room that we need already, and it was an easy way to save money. If we do want to add a drying rack, we can easily add a tension rod. One of the advantages of ICF homes are the deep window sills. I use mine to store our homemade laundry soap, vinegar, and laundry pins. To the left, you can see part of the towel that hangs by a command hook on the washer for drying out the rim of our front loader. The Missing Sole Mates art that I made a few weeks ago is the inspiration behind this post. Since posting the tutorial less than three weeks ago, it's become our #1 most popular post of all time. No idea where all you fine folks are coming from, but thanks for stopping by! Shh...don't tell, but the closet is still a bit disorganized. I'm still deciding how to use the drawers and shelves. We're coming from a very small laundry closet so the space seems palatial. All that's left is to do something with this wall. Click here to see the idea I'm mulling over. Your laundry room is AMAZING!! Thanks for putting this link in your comment. The baskets, ironing board- what a dream! And I think it's smart that you designed smaller closets to make sure you couldn't have too many clothes (mentioned in your comment). Thanks Jen! Thanks for stopping by! I need to do something with the long wall so I may need to use your cute printables. 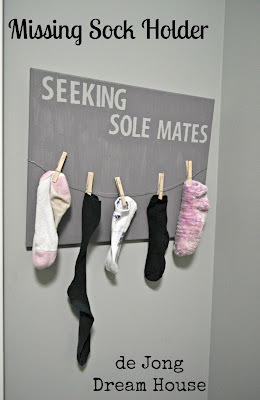 (http://www.thirtyhandmadedays.com/2013/03/laundry/ for anyone else looking for a cute way to dress up their laundry room). What a fabulously clean and well organized bright laundry room! Love the sock finder!! Fun idea! Thanks for visiting! The Sole Mates have been very popular on Pinterst!